Are you planning to holiday in the serene and peaceful environs of Shimla? Then, you have certainly made the right decision as far as the choice of destination is concerned. However, the same wise decision is made by thousands of vacationers from across the country, every year. Eventually, what happens is that all these vacationers fight it out till the eleventh hour to make bookings in different hotels in Shimla; only the lucky ones get successful while rest all are compelled to choose another destination. If you do not wish to get into all these hassles, it is better to do the hotel bookings, much in advance; probably, the moment the holiday plan in this beautiful hill station is finalised. However, just making the bookings is not the solution; actually, the need is to zero in on those hotels, which you think will cater to your needs and fit your budget. If budget is not a constraint for you and luxury is on your mind, then staying at some of the top hotels in the city like Radisson Shimla should definitely get you interested. This plush property, located on Lower Bharari Road, is known to offer splendid views of the hill station. It lies at a short distance from the popular attractions of the city like Christ Church, Jakhu Temple and Gaiety Heritage Cultural Complex. The hotel offers accommodation in different room categories, including Deluxe, Business Class, Deluxe Suites and Executive Suites. Each of these spacious rooms is equipped with modern amenities, such as LCD television, personal safe, tea/coffee maker, hairdryer, Wi-Fi internet and iron with ironing board. Besides in-room amenities, Radisson Shimla offers other facilities like outdoor swimming pool, pool table and steam room. Some of the chargeable services on offer are car rental, travel desk, foreign currency exchange, doctor on call, business centre and Sansha spa. Apart from in-room dining, guests can enjoy Indian, Continental and Asian delicacies at the on-site restaurant called Cafe Valley Vue, which can accommodate up to 62 people at any given time. This property has a wonderful meeting space, called Good Wood Hall, where up to 100 guests can be accommodated; whether, it is a business meeting, seminar or social get-together. The seating arrangements in the hall can be planned in the classroom, boardroom, cocktails, U-shape, theatre or sit-down style. The hall is equipped with overhead projector, multimedia projector, screen, television, printer, photocopier, fax machine and internet access. 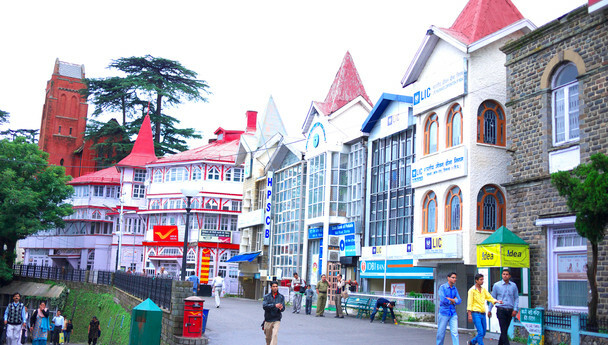 Shimla has always been a favourite among vacationers for its pleasant weather, but there is much more at this place that draws thousands of visitors here, each year. While exploring this city, you will have a lot of options as far as sightseeing is concerned. Some of the must-visit attractions in this scenic hill station are Sankat Mochan Temple, Jakhu Hill, Christ Church, Shimla State Museum, Gaiety Theatre and Viceregal Lodge. Spending time at the ever-so-popular Mall Road should definitely be on your list. This shopping street buzzes with tourists all through the day as it houses several restaurants, shops, bars, clubs and tourist offices. The closest air gateway to this hill station is in Chandigarh. The airport at Chandigarh is well connected to different parts of the country courtesy domestic airlines. This place is also accessible by road, with regular buses available from the places like Chandigarh and Delhi. An alternative way to reach this destination is to reach till Kalka, and from there enjoy a scenic ride on the Kalka-Shimla Railway line, which finds its mention in the Guinness Book of Records.